Does that say 50 cycle? Where is this? We have done a few buildings with both 50 and 60 cycle systems. As Sir Arcsalot mentioned these where buildings that either made or repaired 50 cycle equipment. Supposedly there are areas in theU.S. with 50Hz power systems instead of 60. I dont know where, just something I read somewhere. Exactly how are them wires coming out through that box?. Obviously not through proper Bushes. I can see Red, Green and a Black wire. Shouldn't this have some sort of a recept on it?. 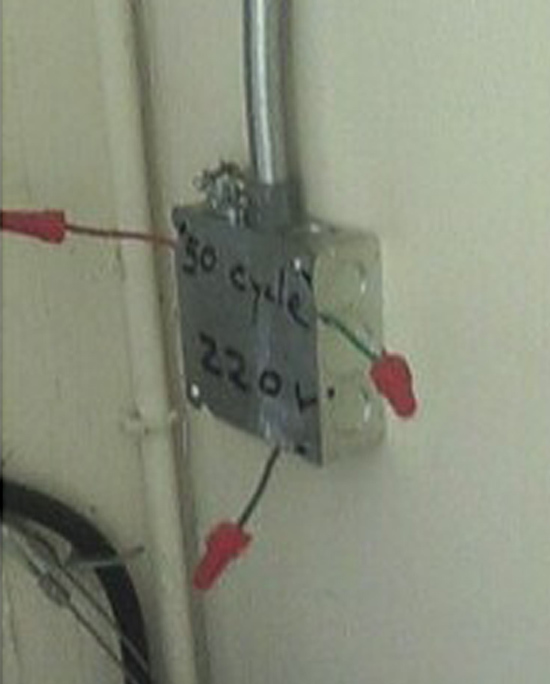 Looks like some sort of a test connection, but it's not the way I'd be looking to conect to 220V. Would you be allowed to use an European outlet meant for 220V 50Hz at the appropriate amp rating? It wouldn't have the "UL" on it, but would the European approval be acceptable? Using the European outlet would prevent someone from plugging in a load that wants 60Hz. And it would be obvious to the userd that that outlet is the 50Hz one. This is wake up lazy warehouse workers. Keeps them from leaning on the wall. The wire nuts were for the benifit of the guy with the camera, I'll bet they are normaly left off with live ends exposed. There are USA (NEMA) style outlets made legal for use in some places in Europe. I would guess there would be some European style outlets made legal for the USA. But, I've never seen the latter. Apparently the 55-0-55 volt worksite power system used in UK likes to use the NEMA 5-15 outlet style. It would be close to the NEC article 647 wiring here (except they ave 50 Hz and we have 59.9999 Hz). We have 59.9999 Hz??? Would you please expand on that a bit? Thanks!